﻿﻿﻿﻿Today nonfiction author Sneed Collard shares his experiences with self-publishing. Thanks for your contribution, Sneed. Nine years and nine books ago, I launched Bucking Horse Books. To many, diving into self-publishing seemed a rash decision—especially given the fact that I’d already had more than fifty books published with other publishers. Then again, in 2010 the Great Recession had rendered new book contracts as rare as Big Foot sightings, and it became clear that if I wanted to continue having books published at a reasonable clip, I would have to do it myself. 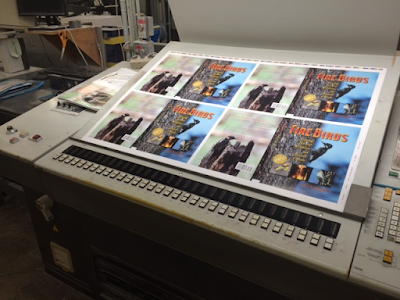 books in various stages of printing and binding! My approach to self-publishing has been different than most. Other self-published children’s book authors have typically gone with a company such as Amazon or Ingram to print and sell their books on demand. Instead, I took a more traditional tack. 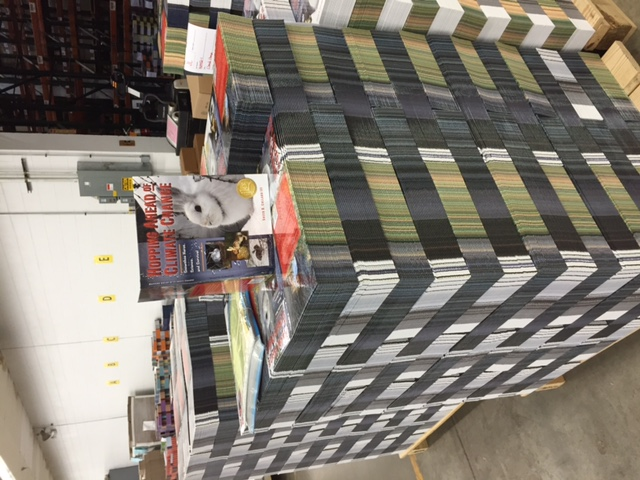 I hired a publisher/distributor to put my books in their catalog, warehouse them, and fill orders. Everything else was up to me: design, editing, printing, reviews, advertising—everything. It’s been a learning curve. 4,000 book covers, waiting to be applied! One thing I quickly discovered is that if I didn’t nab at least one or two solid reviews in top-line journals such as School Library Journal, Booklist, or Publisher’s Weekly, my book would be dead on arrival. Fortunately, my reputation from previous books helped my self-published works continue to receive good reviews. Lesson: if you can’t get these kinds of reviews on your own, you probably don’t want to self-publish. 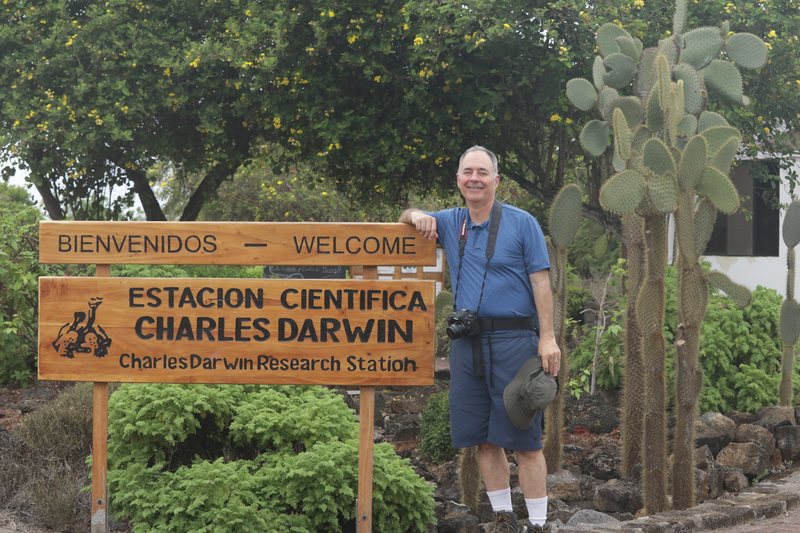 Another thing I learned is that books that stuck to my traditional strengths—science, nature, and the environment—did better than fiction and other areas that I wasn’t as well-known for. Of my four self-published novels, two made modest profits, while two others completely wiped out those meager gains. Those results compelled me to focus more on science books, a decision that has paid off. Three of my last four books have been in this genre and all have not only made money, but continued to build my science-writing reputation. 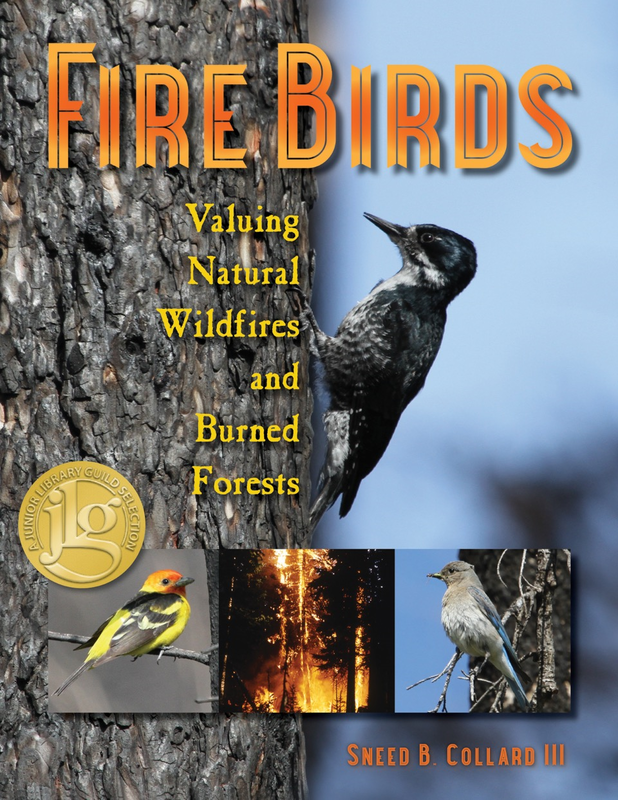 Fire Birds: Valuing Natural Wildfires and Burned Forests earned both Junior Library Guild and NSTA/CBC Outstanding Science Books selections. Ditto for Hopping Ahead of Climate Change: Snowshoe Hares, Science, and Survival. Both of these books have won nice awards to boot. My latest, Woodpeckers: Drilling Holes and Bagging Bugs, is also a NSTA/CBC selection and earned a starred review from Booklist. Which leads me to perhaps the most important lesson I’ve learned from running Bucking Horse Books: the books have to look great. I rarely see a self-published book that doesn’t look amateurish or poorly made—never mind the quality of the writing. To really make a go of self-publishing, you have to not only be a top-notch writer, you have to find a top-notch book designer. Kathy Herlihy-Paoli of Inkstone Design designs my books, and hiring her was one of the best decisions I’ve made. I never stop marveling at the ideas she comes up with to make each book look sharper and more appealing than the last. I also hire freelance editors as needed for my various projects. I can’t claim that my books always appear error-free, but they compete in quality with almost everything I see from big name publishers, a fact borne out by reviews, awards, and other honors. I want to point out that for me, self-publishing is just one career tool. I still submit to and publish a variety of books with other publishers. Which leads to the question: do I recommend other children’s writers self-publish? Answer: only in very specific circumstances. 32-page picture book and will be released this spring. If you do a ton of school visits where you sell your own books, yeah, self-publishing can make you bigger profits than your paltry ten- to fifty-cent royalties through traditional publishing channels. If you come up with concepts that are ahead of traditional publisher thinking, you might also want to consider self-publishing. In my career, I have often written books that publishers just weren’t ready to take on—humorous science books, for instance, or books about biomes and invasive species. If you believe strongly in something, then you may just want to take the leap. Again, all of this assumes that you can produce books that are just as well-written and illustrated—and are as well-produced—as books from established New York, Massachusetts, Maine, and California houses. If not, you’re probably better off continuing to pound on the doors of other publishers. At least until the next recession. 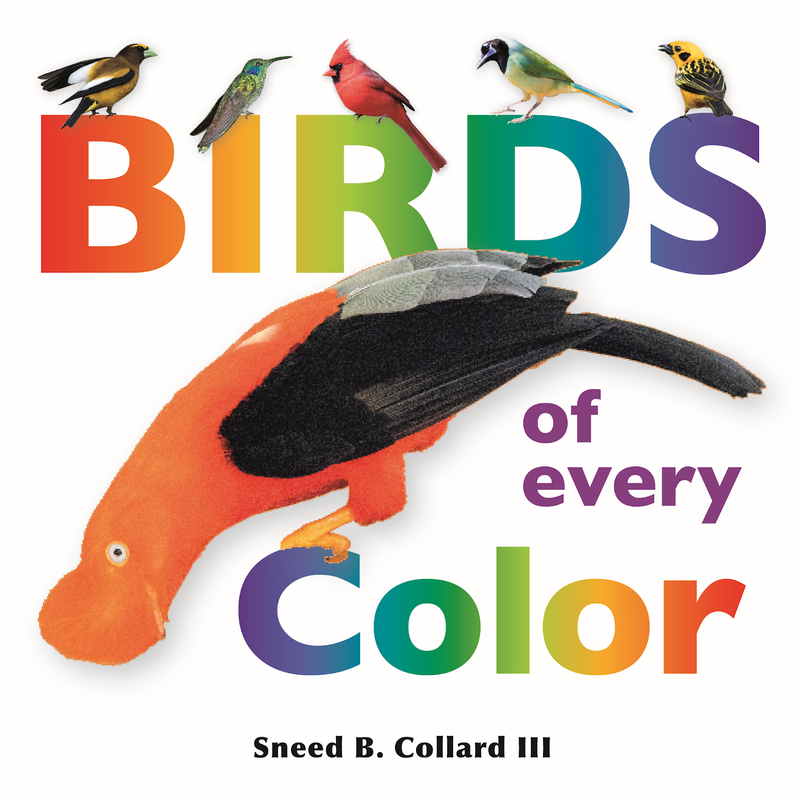 Sneed B. Collard III has written more than eighty books for young people and adults, and is the recipient of the Washington Post-Children’s Book Guild Nonfiction Award for his body of work. His tenth Bucking Horse Books title, Birds of Every Color, comes out this March and features photographs by Sneed and his teenage son, Braden. To learn more about Sneed, his books, and school visits, explore his website www.sneedbcollardiii.com and the birding blog by Sneed and his son, www.fathersonbirding.com. You can contact Sneed directly at collard@bigsky.net. Thank you for your input. I've self-published a children's book that hasn't earned out yet (due to cost of illustrator) but the experience and learning were worth it. Sneed, I met you eons ago at Chautauqua (2006). It's great to see you succeeding with your publishing venture! I plunged into self-publishing with a YA novel (Bound) and it's been great fun, but at the same time, I struggle to get my book into schools and libraries. How did you get your indie book reviewed by Booklist and SLJ? Thanks. Thank you for this informative post! Good luck Sneed with your future books and thank you Melissa for posting this! Thanks for sharing this! I had no idea some of your books were self-published. I loved both Firebirds and Hopping Ahead of Climate Change too--fascinating and informative books. Looking forward to the woodpecker one.